STOCKTON, Calif. - The Stockton Ports have scored in the bottom of the first inning in five of their first six contests. Scoring late, however, has been an issue for the Boys of Banner Island. The Ports got an early home run from Lazaro Armenteros and held a 3-1 lead going into the sixth. The San Jose Giants, though, would score three in the sixth and hold off a late Ports rally to send Stockton to its fifth straight loss by a final of 4-3 on Tuesday afternoon at Banner Island Ballpark. Armenteros started the scoring with his first home run of the season off Giants starter Jose Marte in the bottom of the first. It would be the only run allowed by Marte as he was lifted due to injury while he was warming up to pitch the third inning. San Jose quickly tied the contest in the top of the second. Joey Bart doubled to open the inning and, two batters later, scored on a double by Manuel Geraldo. It was the only run allowed by Ports starter Daulton Jefferies who went three innings and allowed two hits while striking out four. The Ports got the lead back in the third facing Giants reliever Trevor Horn. With one out, Armenteros walked and Beck doubled. With two aboard, Alfonso Rivas singled to drive in Armenteros and give Stockton a 2-1 lead. Jeremy Eierman followed and hit into a fielder's choice force play to score Beck and make it a 3-1 contest. Jared Poche'' (0-1) took over for Jefferies to begin the fourth and set down the first six batters he faced. In the sixth, however, Poche, gave up a leadoff triple to Logan Baldwin and then issued a walk to Bryce Johnson. With runners at the corners, Orlando Garcia hit a sac-fly to right to score Baldwin and cut the Ports lead to 3-2. Heliot Ramos followed with a two-run homer to center that vaulted the Giants in front 4-3. Poche' would go 4 1/3 innings and allow three runs on four hits while walking two and striking out four as he suffered the loss in the contest. Camilo Doval (1-0), who pitched a scoreless bottom of the fifth inning for San Jose, would pick up the victory on the afternoon. JJ Santa Cruz took over for Doval in the sixth and, after three walks, faced a bases-loaded situation with two outs. JJ Schwarz, the runner at first, would be caught off the bag on a throw down from the catcher Bart. With Schwarz hung up between second and third, Jameson Hannah tried to score from third base and was thrown out to end the inning. Santa Cruz would pitch two scoreless innings in relief for San Jose. Israel Cruz (SV, 1) came on to begin the eighth inning for the Giants and pitched around a one-out single by Hannah. In the ninth, Cruz issued a one-out walk to Nick Allen. Armenteros followed with a line drive into the left-center field gap. Allen was waved around third but cut down on a relay to the plate made by the shortstop Geraldo. Armenteros advanced to third on the throw that came home and was at third base with two outs and Beck at the plate. Beck would hit a pop-fly that looked to be playable for Bart well in foul territory behind home plate. Bart looked like he was camped underneath the ball, but the wind blowing out pushed the ball back into fair territory and it dropped in front of home plate and in front of the pitcher Cruz. Beck, who was convinced the ball would be played in foul territory, tried to race up the line but was thrown out by Cruz as he picked the ball up and fired just in time to first base to get Beck and end the ballgame. Cruz, who pitched the final two innings for San Jose, would pick up his first California League save. 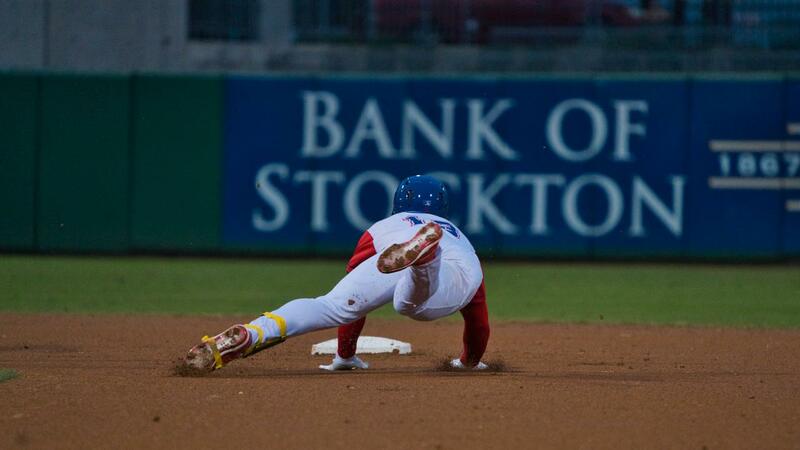 The Ports will look to snap a five-game losing streak when they close out a seven-game homestand on Wednesday night at Banner Island Ballpark. Right-hander Mitchell Jordan (0-0, 3.60 ERA) makes the start for Stockton, opposed by San Jose southpaw John Gavin (0-0, 4.50 ERA). First pitch is set for 7:10 p.m. PDT.